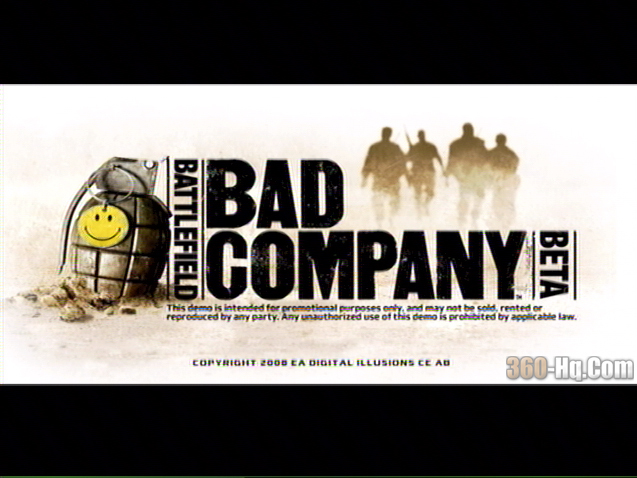 "gamexxover" from www.360-hq.com is currently involved in the new Battlefield: Bad Company BETA for Xbox 360 owners and has been kind enough to let us all know his first impressions. So read on..
After playing the beta pretty hard for several days I thought I would share some of my impressions. First I'll say the feel of the game is very much like Battlefield 2: Modern Combat (BF2) with an over haul. GOOD - 100% of the buildings and structures are destructable, You can break down doors and fences and even trees with anything including your knife, walls and other tougher structure requires a little more punch, any explosive will do it, m203 is usualy the weapon of choice which you get 6 shots with and if you find the ammo box you can rearm with out respawning, But dont worry about being noob tubed to death as the blast radious is small and not overly powerful when used on other people, you can take a nearly direct hit and still survive. BAD - 100% of the buildings are destructable but no building is 100% destructable. you can not totaly collapse a building, you can take out the entire ceiling and all exterior walls on houses, a couple inner walls will remain to keep a skeleton structure up with floors intact, Brick buildings are the same but some will have a wall on one side that will not come down, but 3 out of 4 aint bad. GOOD - lots of cover, more than in battle field 2, even in the desert map there is alot of palm trees tall and short to cover you. BAD - People can spawn off of you, you work hard to be realy sneaky and find a great spot to snipe from or just work the laser in total stealth, you are all set, then some goof ball spawns off of you and opens up with his LMG standing right next to you, putting all enemy eyes on your possition. NO PRONE!! the developers have decided that in this game players will not be able to go to a prone possition, this is very bad when you are behind cover but your head sticks up when crouched, someone opens up fire on your possition you can not take cover by going prone. Not just snipers, no one can go prone. GOOD - Not much change at all, same as BF2 but with one big fix, the tanks are now not stoped in thier tracks by a mear fence post, wreckage or a 55 gal drum in the street, you can pretty much go over and through most anything, you will have a blast just driving through the forrest clear cutting every tree like a weed eater through a flower garden. BAD - you can still get stuck in some dips/ shallow holes in the terrain but this is rare. --- The tanks are much slower than in BF2. BAD - These are not your fathers Humvee's, these babys are stuck in first gear, they are very slow, I would estamate a top speed of about 20 mph maybe? Much slower than those in bf2. Click the read more link to view the entire story and don't forget to get involved in our xbox 360 forums. GOOD - Whats not to like, the pilot can fire 8 missiles at a time then you have to pause to let the guns cool down/ reload, about 8 to 10 seconds, this is better than the BF2 version where the helicopers could just pour missiles non stop, better for everyone --- The copilot can man the belly gun that seems to be a 20 mm cannon with explosive rounds, also with a cool down period, you will find that all vehicle weapons and mounted guns all have a cool down period to prevent people from pouring out death non stop. This is basicly a baby sport version of the Humvee and has a grenade launcher attached. GOOD - these vehicles at least are FAST. if you laser an enemy boat you will not be able to get your bomb to stear to it as it moves out of range too quick. BAD - While tanks can take alot of RPG's before they go down the boat is fairly weak and will be a gonner with one hit, Also if you are not moving you are a sitting duck in the boat and also if you jump out and try to swim away. if the boats moving you are good to go, the second you stop you are screwed. ROCKET LAUNCHER - This is basicly an AT4 on a tripod, with 1 shot per 6 seconds or so, unlimited ammo. Found on ground at some bases but mostly on a roof of a flat top desert building here and there. HEAVY MACHINE GUN - Other than ontop of the Humvee, you will find these ontop of buildings, a .50 cal machine gun with a steel plate shield to help give you a little cover. has a cool down period after several seconds of firing. AA GUN - Very cool, an actual AA gun, this is a gun you sit in and fire at anything including helicopters, the rounds travel out and explode into flack when they get close to something, so you dont have to hit the helicopter directly, just get close and you will see explosions all arround the helicopter, the AA gun also makes quick work of trees and tall buildings stripping them to frame work in seconds. The AA guns are placed on roof tops and can look straight forward and up and 360 Degrees, But can not look down, so you can be pointing down the main street and a tank can be rolling up and he can travel under your line of fire. If you are on the ground you are safe from this gun unless you are on a hill. BIG GUN - This is a huge artilary gun, fires 5 shots in rapid succession at a time with about 20 second cool down, a devistating weapons for anyone in its range ( which is about the equivalent of about 3/4 of a mile to a mile. When you jump in this gun a camera view comes up, with a view from the heavens, you just scroll the X to your target and let loose. The view is actualy a live cam view rather than a map view. TRACER GUN - This is a little dart gun that the specialist class gets, you can use this to shoot an enemy vehicle or emplaced weapon, once you do this a little red light blinks on the target, this acts as a homing device and cant be removed. What this does now is allow a team mate that is using RPG to actualy lock on to the tagged vehicle and turns his rocket into a homing missile. Other wise its just a regular point and fire rocket. POWER TOOL - This is the portable impact rench the support class used to repair vehicle, but I found it destroys things even better, you can rip appart an enemy tank in about 3 seconds and watch all the armor fall off, its like a portable chop shop, And it is also the best tool for busting through walls, Sure with a noob tube you get 6 holes in walls but the power tool is infinite, in the city with dozens of buidings, why go arround buildings or even bother finding the doors? I just pull out the power toos and go straight throug 12 buildings side by side and make a tunnel straight through. The power tool can take apart anything that is destructable with the exception of sand bags, trees, and gold crates. I also find this tool handy by going into a building, going up to the attic, drilling a hole in the roof and jumping through it to get roof top access, you can then pull out your device to drop mortar strikse from your pearch. Communication - This game is fun when team mates communicate, but people rarely do in this game. and what makes it worse is that you can only communicate with people in your squad! Lets say you have 10 people on your team---you will be placed in a SQUAD with 3 of those team mates and those are the only ones you can communicate with. Now if you are unlucky enough to get stuck with the 3 guys that dont talk then you will have a quiet and boaring game, even if the 6 other guys are chatter boxes you will not know because you are stuck with your squad. 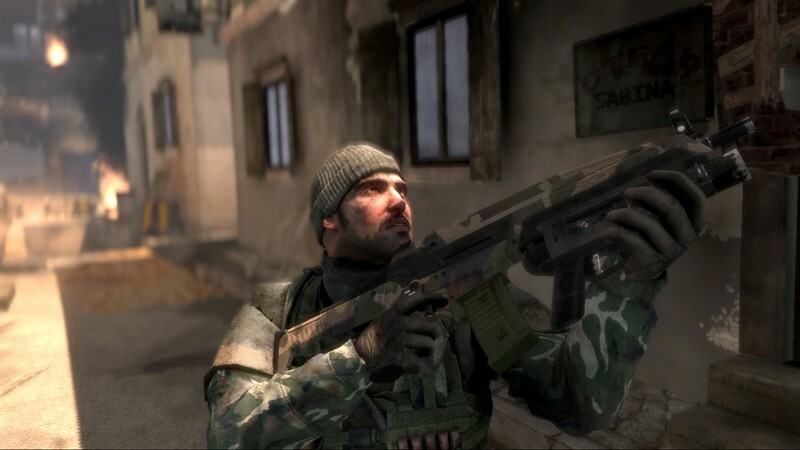 This would be like playing COD4 with a full game, then the game randomly picks 2 team mates you are allowd to talk to ingame, and the rest you cant communicate with at all, and there are alot more people that play this game that will not talk than there are that do, I would say out of every five games I play I might find 1 game where someone will communicate. This game is about team work, its not a team death match, we need to attack or defend an objective, we need to communicate what is going on arround us to be effective. They need to open ingame chat for all team mates, this squad thing is not giong to cut it, it is so bad it is actualy a deal breaker for me on wether or not I buy this game.